Get to know your audience across multiple streaming destinations with real-time data from Livestream's native analytics dashboard. 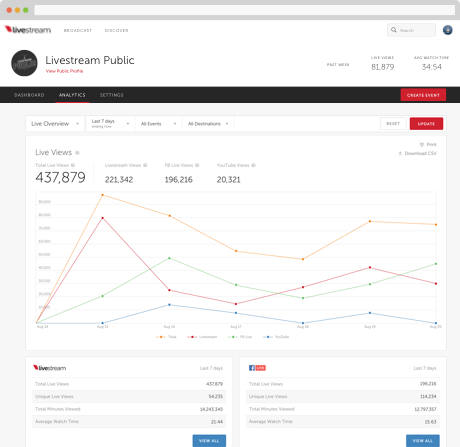 Livestream Analytics tracks your live event’s stats in real-time. With it, you’ll know how many people are watching, where they’re watching from, what device they’re watching on, and more. It’ll help you analyze your viewership and form a clear vision of your audience and their preferences. Analytics are included free with our Premium and Enterprise plans for both existing and new customers. Sign in or choose from the plans below and unlock your data today.